Gunnar Jóhannsson and his wife Vigdís Þórarinsdóttir among wit their family run a horse breeding farm and training station at Árbær in South of Iceland. Their breeding started around 1990. Today 2 - 5 foals are born every year at the farm. Guðmundur Bæringsson has been working at the farm since June 1998 when he and his family moved from Stykkishólmur. For the last years Keilir frá Miðsitju and Aron frá Strandarhöfði have been the main breeding stallions at the farm. Keilir was owned by the farm from 1998 - 2009 and Gunnar owned a big part of Aron until 2006. Among with Keilir and Aron stallions as Hrímbakur frá Hólshúsum, Kjarkur frá Egilsstaðabæ, Kolfinnur frá Kjarnholtum, Nagli frá Þúfu, Orri frá Þúfu, Sær frá Bakkakoti, Vilmundur frá Feti and Þóroddur frá Þóroddsstöðum have been used. We hope that this website gives you more details about the farm and its breeding stock. All horses in Árbær are marked with microchip, freeze-mark and are registered in Worldfengur. 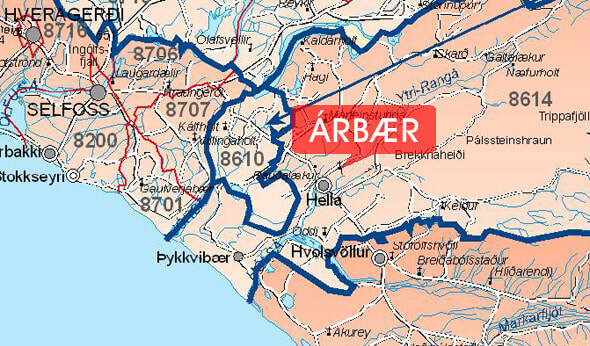 Árbær is the last turn to left before you come to Hella on the way from Reykjavík. The farm is 4 km from highway 1.